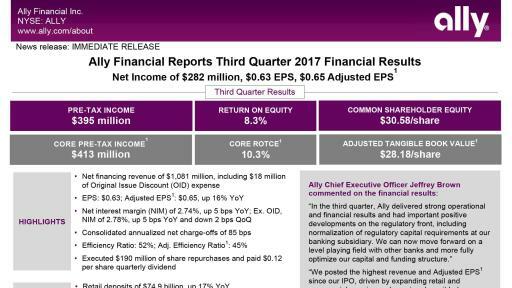 CHARLOTTE, N.C., Oct. 25, 2017 -- Ally Financial Inc. (NYSE: ALLY) today reported its third quarter 2017 financial results. View the full press release in PDF. Conference Call Information: Dial 844-530-6677 (or +1-508-637-5641 for international access) at least 10 minutes prior to the start time and enter the conference ID code 90740829. The presentation and financial supplement will be posted in the Events & Presentations section of Ally's Investor Relations website on October 25, 2017, at approximately 7:30 a.m. EDT. Archive: A taped replay of this call will be made available from 12:00 p.m. EDT on October 25, 2017, until November 1, 2017. Please dial 855-859-2056 (or +1-404-537-3406 for international access) and enter the conference ID code 90740829 to access the taped replay. 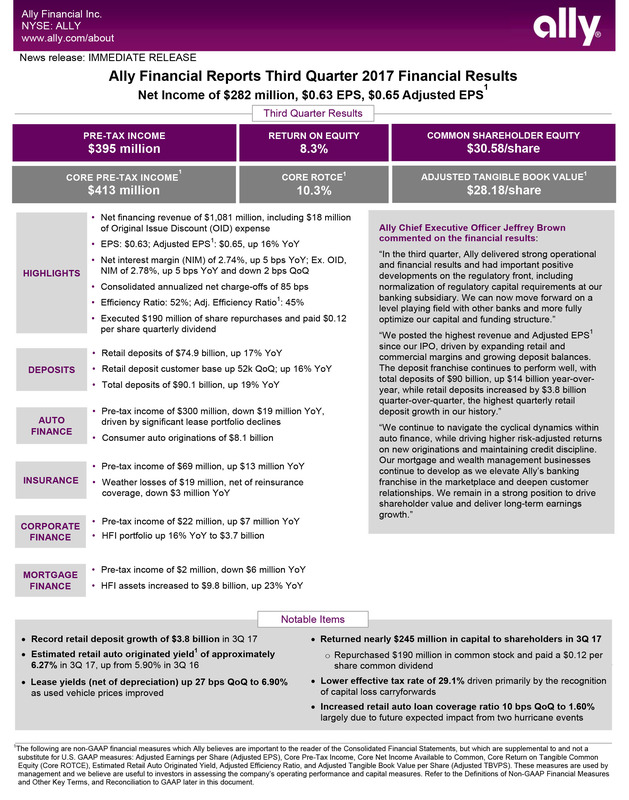 A replay of the webcast will also be made available on the Ally Investor Relations website. The company had approximately $164.0 billion in assets as of September 30, 2017. For more information, visit the Ally press room at https://media.ally.com or follow Ally on Twitter: @AllyFinancial.